Where oh where am I? On a hill above the east end of Cienega Road. I'm looking southeast. Somewhere down there is Highway 25. Yes, I'm sure that's it. 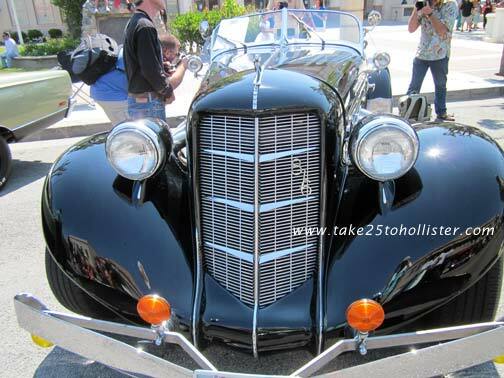 Yes, there were lots of gorgeous cars at last week's annual Downtown Hollister Street Festival and Car Show. Also, lots of people of all ages enjoying the cars, the live music and performances, and free watermelon. What did you like most? 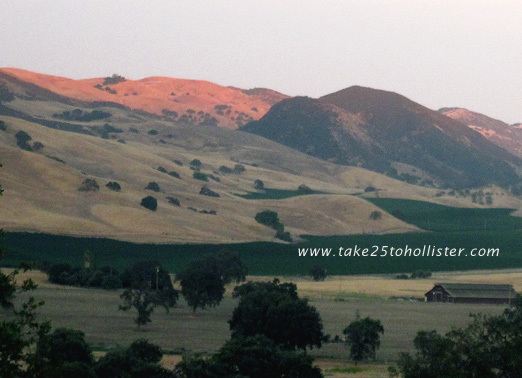 To see more photos of the event, head over to this photo album at the Take 25 to Hollister Facebook wall. One of the featured speakers was Eddie Madril, a member of the Pascua Yacqui tribe of Southern Arizona and Northern Mexico, whose last story was the hoop dance. These photos only give you an inkling of the beauty and wonder of his story. 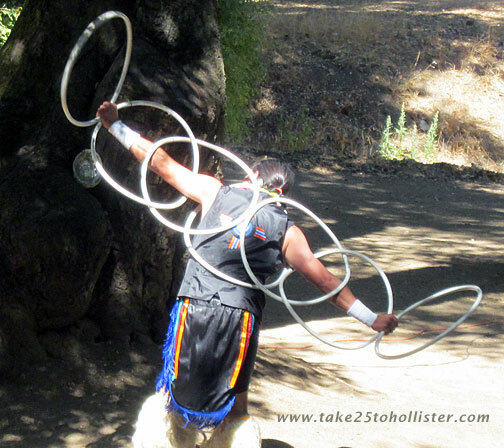 Here's a Youtube video with Madril in which he talks about and performs the hoop dance. I love how these people over on Riverside Road think! 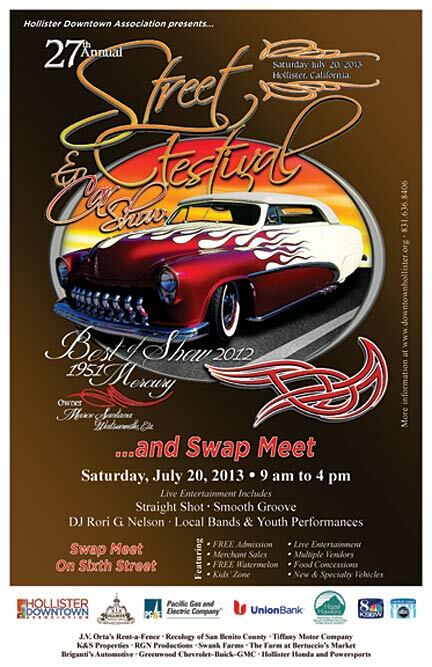 This Saturday, July 20, 2013, is the 27th annual Hollister Street Festival, which includes a car show and a swap meet. San Benito Street will be closed from Fourth to South Streets. The swap meet, which is new this year, will take place on Sixth Street. 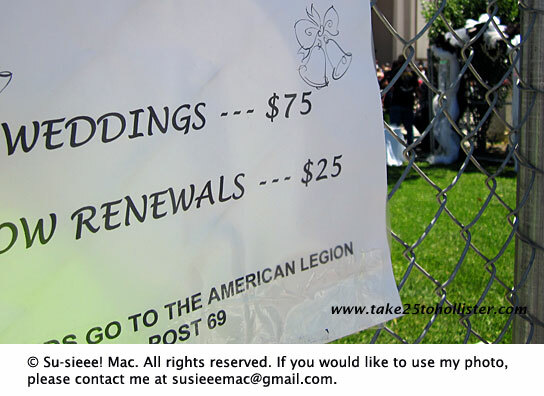 The hours are 9 a.m. to 4 p.m. Admission is freeeeeeeee! You can't beat that. 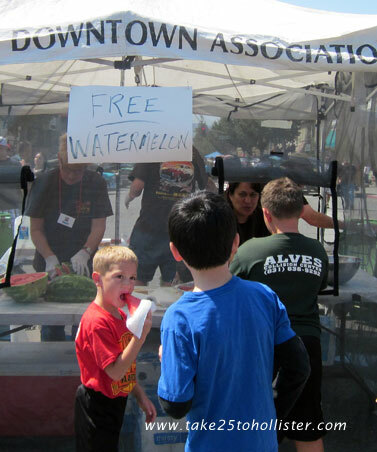 The festival is brought to us each year by the Hollister Downtown Association (HDA). We truly appreciate their hard work. For more details about the festival, check out the HDA link. 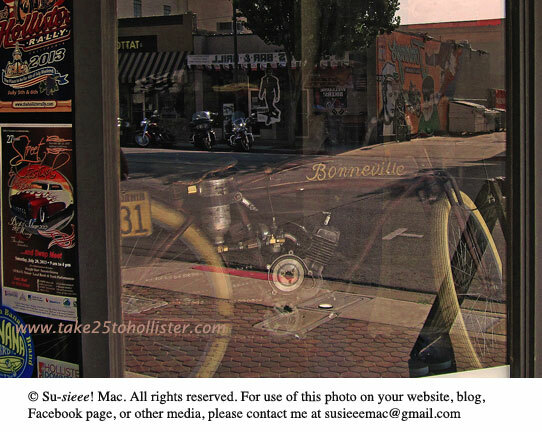 The image of the Hollister Street Festival and Car Show poster is courtesy of the Hollister Downtown Association. Thank you, Sharlene and the whole HDA crew. Don't you just love the fact that new shops and restaurants have opened, or about to open, in Hollister? 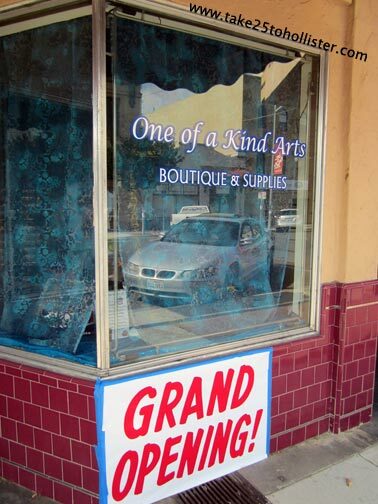 Just before the Fourth of July, the Husband and I came across One of a Kind Arts, a new boutique on Fifth Street, next to the Granada Theater. It was the end of the day, so all we could do was peep in the windows. According to the One of a Kind Arts website, the store is "A year round Arts and Crafts Fair that features handmade, unique, vintage and one of a kind items." Local artisans can sell directly to the public through the shop. How cool is that? Check it out for yourself. 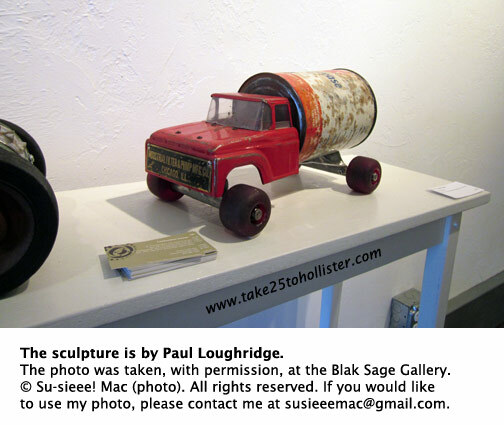 Here are the links to the One of a Kind Arts website and its Facebook page. Buena fortuna, One of a Kind Arts! Happy, Happy Fourth of July! 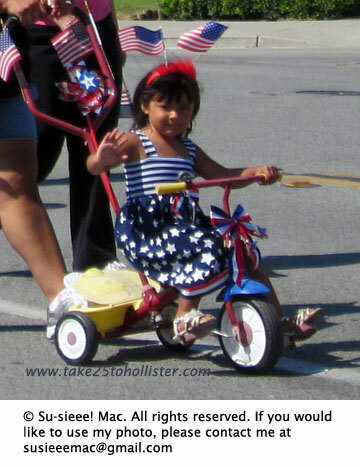 I saw the sweetest parade ever in Hollister. How sweet? I started crying as the last participants filed by me. 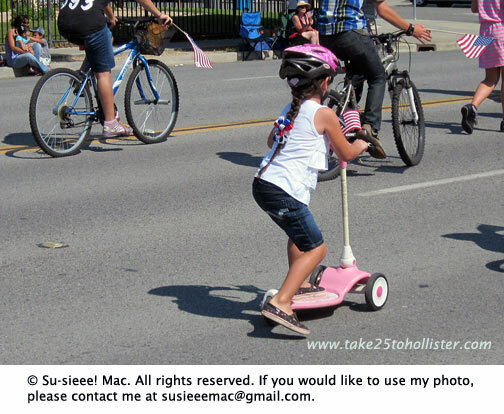 I'm so glad I decided to pedal down to Memorial Drive for the Fourth of July Kiddie Parade. Uncle Sam in all his glory led a long line of kids and their parents along Memorial Drive, from the corner of Hillcrest Road to Marguerite Maze School on Meridian Street. 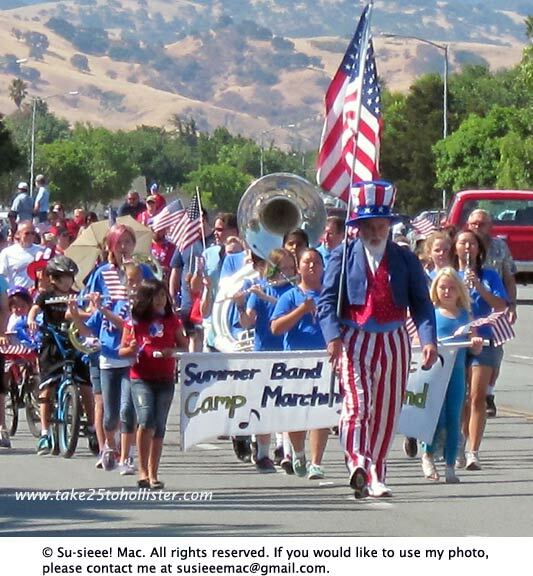 A summer camp marching band brilliantly played. Parents pushed their babies in strollers and pulled their toddlers in wagons. Tiny and not-so-tiny kids pedaled their big wheels, tricycles, and bicycles and pushed along on their scooters. And, of course, there were the parade marchers of all ages. It was just all so cute! The parade was short. Ten minutes, if that. But, all that preciousness made my Fourth-of-July Day. Thank you, all parade participants, for putting the smile in my heart today. 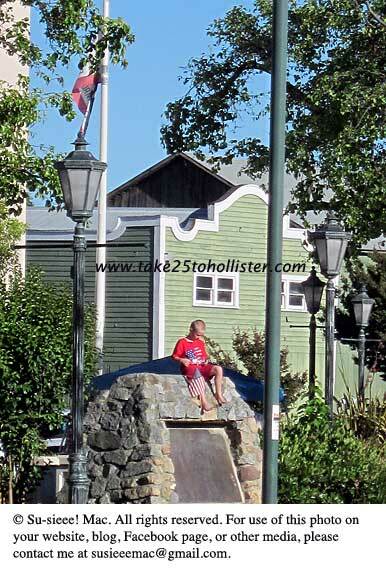 At 8:30 this morning, historical downtown Hollister was hopping. Excitement buzzed up and down the streets. A few vendors for the Hollister Rally were already putting up tents. 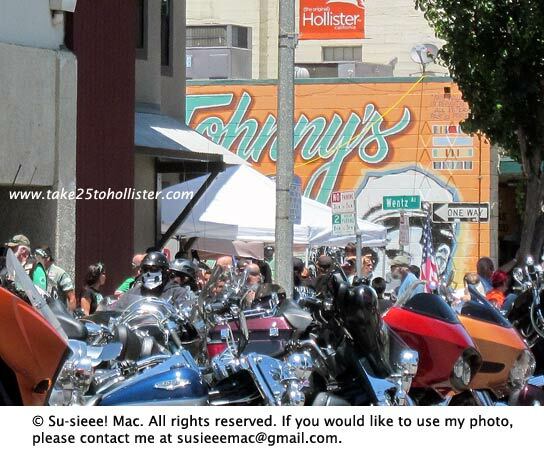 From my vantage point in the bakery/coffee shop (whose name I can't remember) at 730 San Benito Street, I watched the parade of people, cars, and motorcycles pass back and forth. The Fourth of July celebration has begun! 10 a.m.: The Kiddie Parade, from the corner of Hillcrest and Memorial to Marguerite Maze School on Meridian. Starting at 8 p.m. tonight, the following downtown streets will be closed to traffic until Sunday, July 7, 5 p.m.
And, yes, the Hollister Farmers Market will be open today, from 3 to 7 p.m.
Be safe and careful out there while you're having fun celebrating the Spirit of Independence Day! 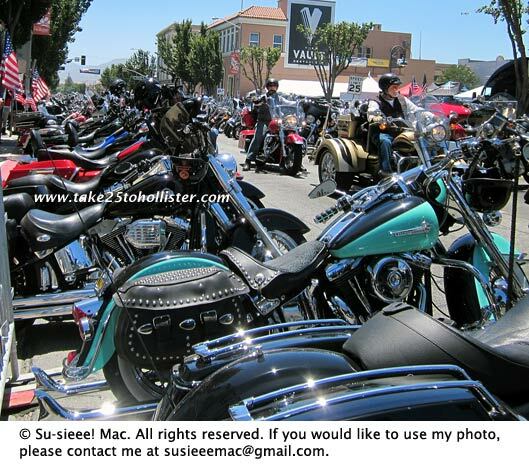 Hollister is gearing up for the motorcycle rally on July 5 and July 6. Are you ready? 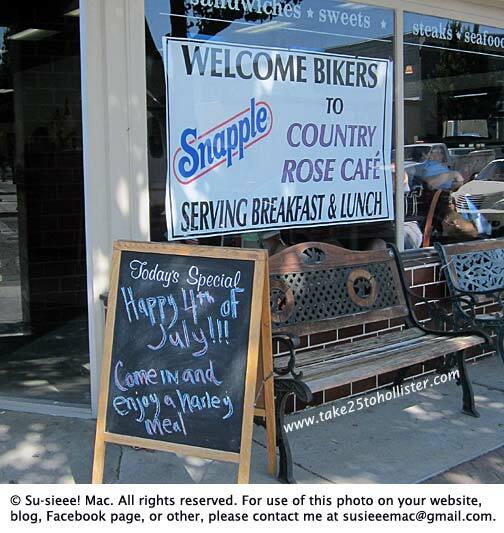 Whether during the Hollister Rally or within the next few days, be sure to go by the Hollister Sign Company at 535 San Benito Street, and check out the vintage bikes on display. They are beautiful! Head into the store while you're there, too. The store sells clothing, Tom shoes, skateboards, and other products along with offering such services as making signs, printing large formats, and custom-made apparel. 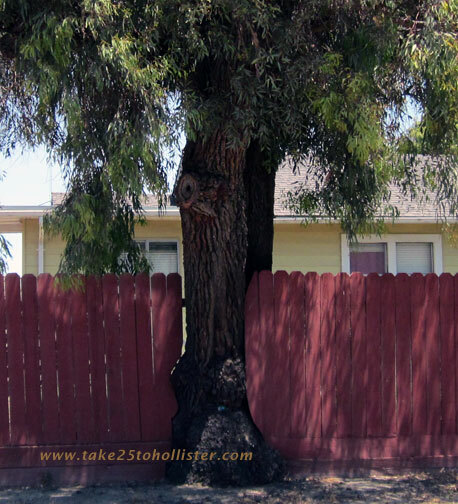 For more about the Hollister Sign Company online, visit its website or Facebook page. 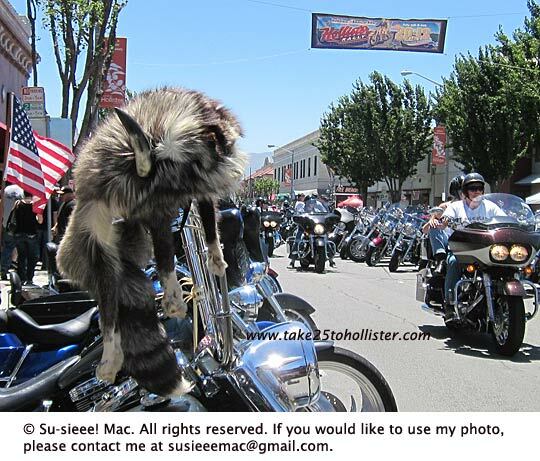 The 2013 San Benito County Saddle Horse Show and Rodeo Parade last Thursday evening was a great one. Lots of beautiful horses clippity-clopped, as well as horseless carriages, old and new, tootled down San Benito Street. You can see some photos at the San Benito County Saddle Horse Show and Rodeo Facebook page. Once I have a chance, I'll post some photos up. 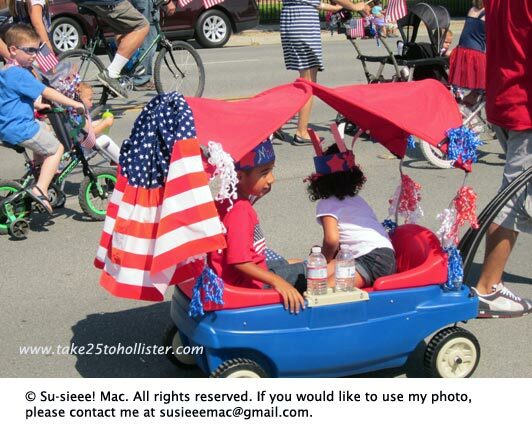 Speaking of parades, the annual Fourth of July Kiddie Parade will begin at 10 a.m. on Thursday. The parade starts in the commuter parking lot at the corner of Memorial Drive and Hillcrest Road, and goes along Memorial Drive to Marguerite Maze Middle School on Meridian Street. 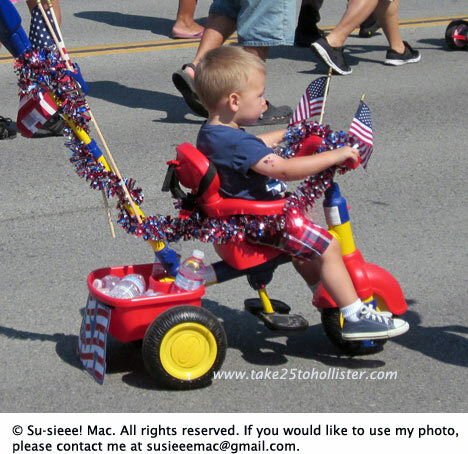 Children of all ages are welcome to participate in the parade. Dogs or motorized vehicles are not allowed. 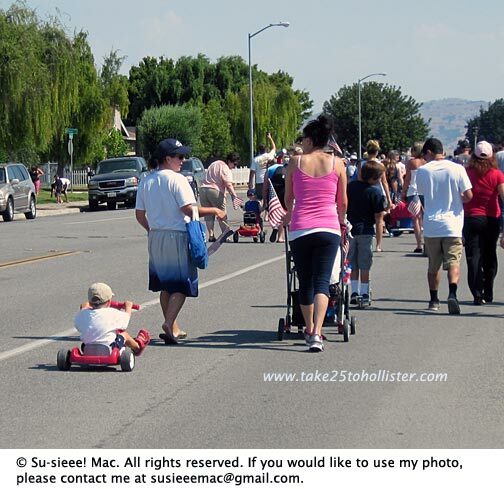 The parade is co-sponsored by the City of Hollister and the San Benito County Chamber of Commerce and Visitors Bureau. And, before I forget, the annual Fourth of July fireworks display will take place at Marguerite Maze Middle School at dusk. Oh, and I almost forgot to mention (l shall blame this heat wave for memory lapses.) 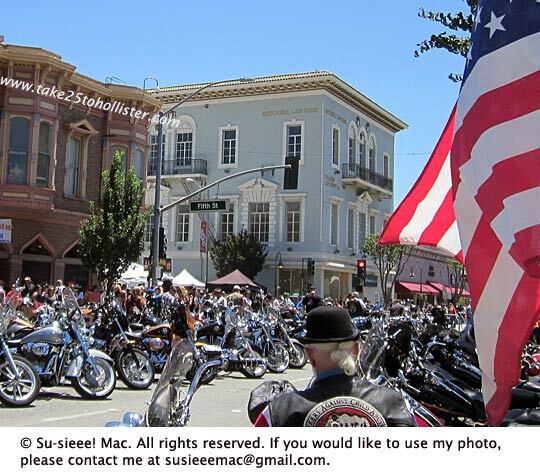 that Friday, July 5, and Saturday, July 6 will be the Hollister Rally in historical downtown Hollister.